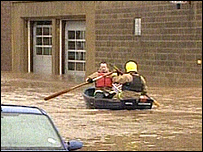 The city of Carlisle has been cut off with people left stranded in their homes because of severe flooding. Gusts of more than 90mph also battered the county and more than 50,000 homes are without power. Cumbria Police spokesman Mike Head said the city centre was "awash" and they are appealing for anyone with a boat to help them reach stranded families. They are also warning people who live on Warwick Road to leave their homes if they can do so safely. 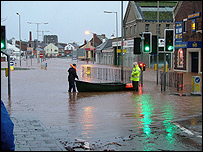 Mr Head said: "We've had people phoning up reporting that the water is starting to creep up the stairs in their homes. "Some houses have been evacuated, although I don't know how many exactly. "The city centre is awash and seeing as it's not right on the banks of the River Eden it must just be from the sheer downpour of water. "We're asking anyone who owns a boat to come out and help us get to the incidents." He said the weather conditions were the worst he had witnessed in a long time but he added that he was not aware of any casualties at present. Mr Head said the roads into Carlisle city centre were blocked with flood water and that conditions were making it difficult for the police force to get there themselves. "At the moment our resources are completely stretched and we've had to close the police station due to flooding," he added.